Jeannie Gray Knits: What's his name? I'm going off topic today. I got a new fish and I'm oddly excited about it. 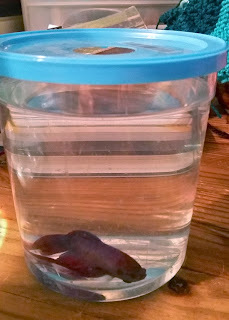 At the moment, he's hanging out waiting for his transport water and his new bowl water to become the same temperature. Originally, I was going to name him Otto after the fish in the children's early reader book, A Fish Out of Water. But he doesn't look like an Otto. He doesn't look like a Mr. Carp either. (Can you tell A Fish Out of Water was one of my favorite childhood books?) 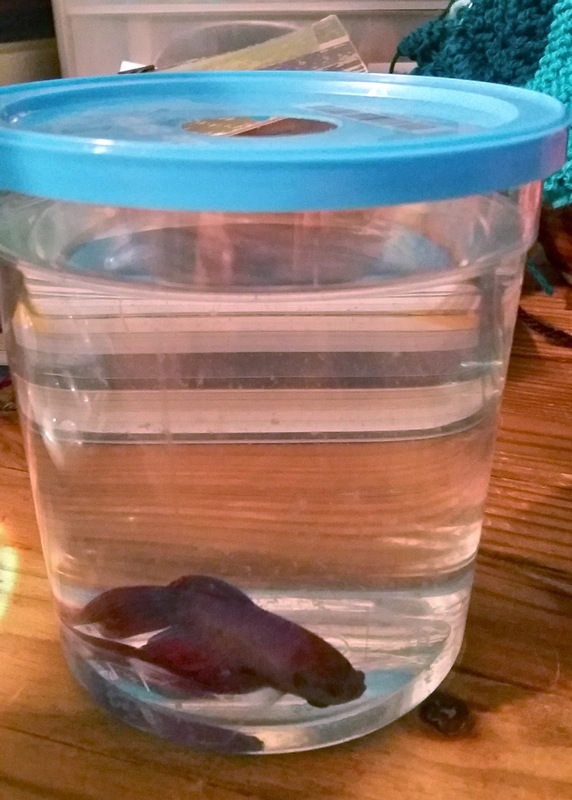 I thought about Prince since he's such a gorgeous purple color (which isn't showing up well in the picture) but.... At the moment, I'm just calling him New Fish. He doesn't seem to appreciate it. Want to help me name him?